I say, the nights are fair drawing in, aren't they? Once the working day is over, I just want to go straight home, onesie-up and make something delicious for tea that doesn't require a tedious traipse around the supermarket for ingredients. All the better if that meal can be rustled up in 15 minutes flat, and hints at days gone by when we frolicked on beaches and feasted on seafood. 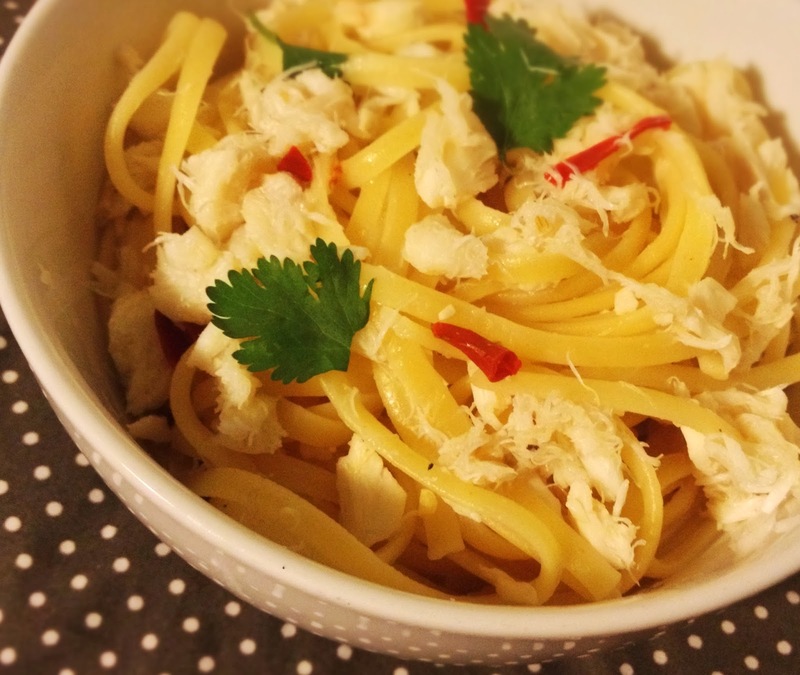 I present to you the very thing to sunny up your evenings: store cupboard crab linguine. Tinned crab gets a bad press but it's come on leaps and bounds in the past few years. I bought decent stuff in M&S and the meat was chunky and flavoursome. Combine it with garlic, chilli, lemon and fennel for a fresh, zingy plate of loveliness that evokes memories of spring and summer, while filling you up with some much-needed winter comfort food. Bring a large pan of water to the boil, add a generous amount of salt, and boil the pasta for 10 minutes, or whatever the packet tells you to do. Meanwhile, in another saucepan, heat the oil and gently fry the garlic, chilli and fennel seeds until softened. Add the fish stock, wine and lemon juice, bring to the boil, then simmer for about 5-10 minutes until the liquid has reduced by about a third. Stir in the crab and the butter and simmer for another couple of minutes. Drain the pasta, add it to the crab sauce, season, and mix together well. Serve piping hot, with parsley or coriander stirred through. This sounds DELISH. On the list of Things To Cook. Hope you enjoy it! I ate it for three dinners on the trot!